VGB can provide the best available knowledge in each of the industrial and business areas we cover. Our team has a wide experience in the design of plants and engineering projects. Within our group, our experience and expertise in innovation and design of new processes and technologies, can assist you with the success of your project work. The engineers at G&B and its partners have the practical experience needed for the mechanical design of waste water and air pollution treatment plants, as well as plants for the reduction of green house gases and gas clean up. 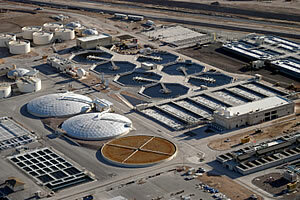 Currently, our engineers are working on the design of waste water plants for several industrial processes. Solid/Liquid Separation: Decantation, Coagulation/Flocculation, Sedimentation/Precipitation, Filtration. Biological Treatments: Aerobic Treatment Units, Sequencing Batch Reactors (SBR), Rotating Biological, Contactors (RBC), Sludge Treatment. Ion Exchange: Cationic, Anionic and Mixed. Membrane Technology: MF, UF, RO, and EDI. Evaporation: Multiple effect evaporators and Mechanical Vapour Recompression (MVR).